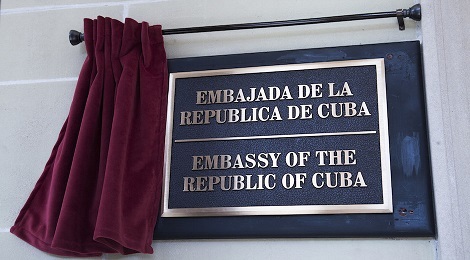 STATEMENT BY BRUNO RODRÍGUEZ PARRILLA, MINISTER OF FOREIGN AFFAIRS OF THE REPUBLIC OF CUBA, AT THE CEREMONY TO RE-OPEN THE CUBAN EMBASSY IN THE UNITED STATES. WASHINGTON, JULY 20, 2015. This ceremony has been possible thanks to the free and unshakable will, unity, sacrifice, selflessness, heroic resistance and work of our people and also the strength of the Cuban Nation and its culture. Several generations of the revolutionary diplomacy have converged in this effort and offered their martyrs. The example and vibrant speech of Raúl Roa, the Chancellor of Dignity, have continued to inspire Cuba’s foreign policy and will remain forever in the memory of the younger generations and future diplomats. Every step forward will receive the recognition and the favourable acceptance of our people and government, and most certainly the encouragement and approval of Latin America and the Caribbean and the entire world. To insist in the attainment of obsolete and unjust goals, only hoping for a mere change in the methods to achieve them will not legitimize them or favour the national interest of the United States or its citizens. However, should that be the case, we would be ready to face the challenge.